South Africa is one of the most important places in the world for our understanding of how human beings evolved. Between September 8 and 22, 2018, an AIA Tours group visited the country, following a diverse itinerary that included many of its most important paleoanthropological sites. We started off near Johannesburg with a visit to the Cradle of Humankind, an area with a unique concentration of sites that date from between over three and 1.5 million years ago and document the evolution of the early bipeds known as australopiths. There we had the privilege of hearing from Drs. Lee Berger and Ron Clarke, both of whom had made important recent finds in the Cradle. This was followed by a journey to the Kapama Game Reserve, adjacent to the Kruger National Park, where we witnessed an environment that comes as close as any in the modern world does to the perilous habitat in which the australopiths lived. This helped us establish a context for the early hominids before we continued north to the atmospheric site of Makapansgat, at which Raymond Dart had developed his influential “Killer Ape” theory in the 1950s. The group then proceeded to Pretoria before flying to Cape Town, where Dr. Wendy Black of the Iziko Museums kindly showed us an important selection of important human fossils, as well as the world’s earliest unquestioned symbolic object: a piece of smoothed ochre bearing a geometric engraving. This was a breathtaking experience. 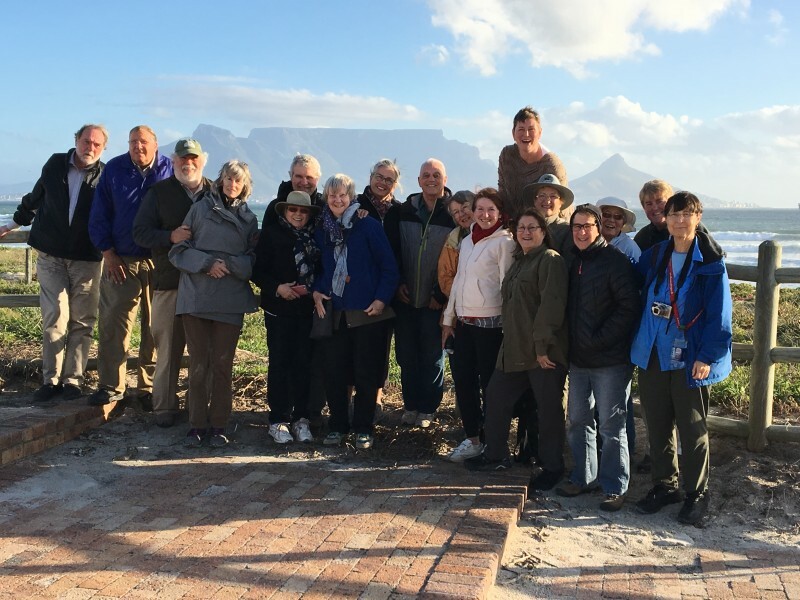 We then visited the fascinating Langebaanweg fossil site and the West Coast Fossil Park, to which we were captivatingly introduced by Dr. Pippa Haarhoff. From Cape Town we then traveled east along the hugely scenic southern African coastline to visit the Blombos Museum and the gloriously-sited locality of Pinnacle Point, with its very early evidence for the blossoming of modern human behaviors and economic strategies. Interspersed with a diversity of cultural and culinary explorations, this itinerary produced a wealth of paleoanthropological experiences that gave participants a great deal to mull over on the flight home. Join Dr. Tattersall on the next departure of this Human Origins in South Africa tour, August 31 – September 14, 2019. Click here for more information!